This is a very soft color - not “invisible” (like most of Sleek's matte shades, and like some other indie shadows) but definitely not highly pigmented. Good to use for softer looks, or as a blending shade. 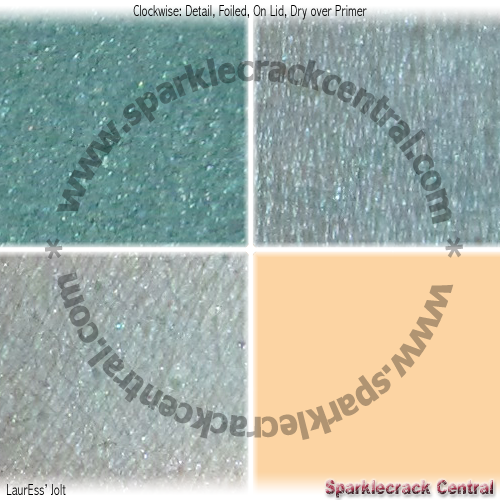 The green deepens when this color is applied wet, and the shimmer is more readily visible; but it's still one of the softer shades I've purchased from Sassy. I might be able to use this patted over a dark cream or gel liner, and get some nice subtle effects. I also tend to lean towards “watercolor” looks, so I can wear this green either wet or dry and it works with both my coloring and my personal style. If you favor bolder looks, this particular shade might not be the best choice for you. 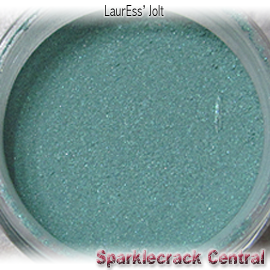 Look into Lyrical or Sorceress instead - both of those shades, also from Sassy Minerals, are deeper and more pigmented than Jolt.